Well, it was time for Halloween festivities here in the entwood. Alas, time has been so short this year, there was no time for clever literary pumpkin carving but we did continue our annual tradition of demanding something in return for some treats in your bag. First of all, you HAVE to say "Trick or Treat." You cannot just shove your bag forward without even a hello. Costumed Kiddies: "Trick or Treat"
Chez BookMoot: "Hello Kiddies, Happy Halloween. Who can tell me the name of one of your favorite books?" I was ever so pleased to hear a chorus of "Oh yeah, I remember this place." Even better were the kids who are so well trained now that they recite the question with us or shout out a book title as we open the door. One of the nicest things about this year's trick-or-treaters is that almost every one of them said "Thank you." Here is this week's schedule for the Robert's Snow Blogging for the Cure features. Library jobs booked all last week and next. Demand is outstripping the time available. M-u-s-t * s-a-y * N-o! Homestead on the point of collapse due to disorganization and columns, heaps, piles, infills of clutter and debris. I've been at junior high and high school this past week. I am dismayed by how much I have not read. As usual, I learn more from the kids than anyone else. Student #1: "Really, Mrs. P, you NEED to read these Warriors books." Me: I saw this (I’d Tell You I Love You, But Then I’d Have to Kill You) was on the Lone Star list, is it good? Student #2: You haven't read this yet? Oh it is SOOO...good. You have GOT to read this. Have you read Twilight yet?" Me: "Uh, no, not yet." Junior high teacher who will probably have a kidlit blog someday: "I told you to read it. I'm not talking to you until you read it." Me: "Uh, no, cataloging these books here. Oh, thanks, I will read this copy that you just put on the desk in front of me." Junior high teacher who will probably have a kidlit blog someday: "I'm not talking to you until you read it." Me: "I'm on page 15." I will be back there on Monday. I have my assignment for the weekend. Ever alert, Entling No. 2 sent on this news about the casting of James T. Kirk and "Bones" in the Star Trek XI movie. "Heroes" fans here in the entwood are happy about the casting of Spock too. "Let It Snow" is the perfect cheer for this effort to benefit Robert's Snow for Cancer's Cure and the Dana-Farber Cancer Institute. 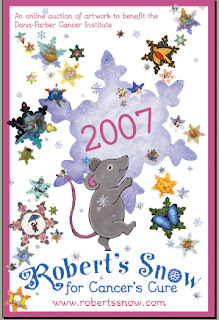 It is also the title of Ruth Sanderson's contribution to the 2007 Robert's Snow auction. 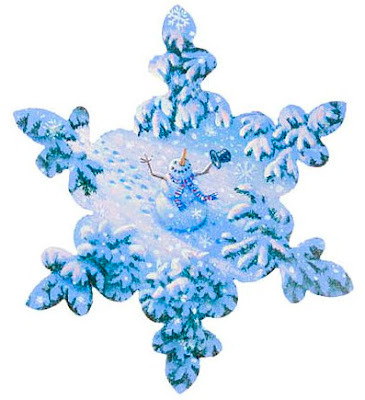 Snow laden fir boughs form the points of the snowflake as a smiling snowman raises his arms towards the sky. His doffed his hat and face express the joy of a snowfall. Sanderson has added a touch of whimsy as closer examination reveals footprints in the snow behind the snowman. Careful attention to detail, rich glowing colors and lush picture storytelling make Sanderson's books a favorite with children. In 2003, young readers in Texas voted for her book, The Golden Mare, the Firebird, and the Magic Ring to win the Texas Bluebonnet Award. Sanderson lists horseback riding as her favorite hobby and her love of horses is reflected in her books. Her horses (and unicorns) have flowing manes and soulful eyes. When girls ask me for a "princess fairy tale" I am always tickled to see their eyes light up when I show them Cinderella. 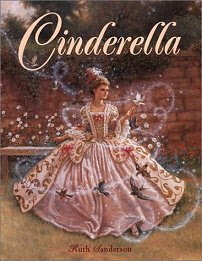 The cover sparkles and Cinderella's dress is a the height of fantasy fashion. Their usual response is "oooooooooooooohhh..."
Golden Wood Studio website showcases her artwork and offers a look at the evolution of a picture from sketch to finished painting. She has a Mother Goose book coming out in 2008 and Jane Yolen posed as Mother Goose. In 2004, Grace Lin and her husband Robert Mercer were inspired to begin Robert's Snow for Cancer's Cure to benefit the Dana-Farber Cancer Institute. Beautiful, one-of-a-kind snowflakes were created by children's book illustrators and auctioned to raise money for cancer research. Sadly, in August 2007, Grace lost her Robert to cancer. In honor of Grace and Robert, the kidlitosphere will be featuring the artwork of some of the illustrators who contributed their talent and time to this year's auction. Three separate auctions will showcase these exquisite original works of art. The first auction begins on November 19. You can see these treasures here. Grace Lin describes her snowflake on her blog a solitary grace. This is the schedule for this week's features. Thank you to Tricia and Jen Robinson for building the links for us to use. Interesting and extremely helpful presentations. A magical brunch at Esme Raji Codell's Book Room, a children's book wonderland if there ever was one. If the setting were not amazing enough, Esme prepared a delicious spread of food that included a blintz cassserole that made me very very happy. Finding out we have more than just our affection for children's and YA literature in common -- We discovered we share similar interests in movies, TV shows, coffee and shoes. Such happiness and joy to find out all the blogs I read, REALLY are written and hosted by such nice, smart and funny people. I think I am the last one to post. As usual, Indefatigable Kelly at Big A little a has an excellent round-up of the posts about the conference. Thank you, Robin Brande for making all this possible! I had several kids at my last junior high gig ask me if I knew the title of the next Percy Jackson book. They were dismayed when I said no. Well, know we all know. The Battle of the Labyrinth. And now I am off to Chicago for the 1st Kidlitosphere Conference. See you all soon. Nominations close November 21st and you get one nomination per category so reflect, ponder and nominate. I will be serving as a judge for Non-Ficton: Middle Grade and Young Adult. Our fearless leader/organizer, Jen Robinson, posted about the committee at her blog.